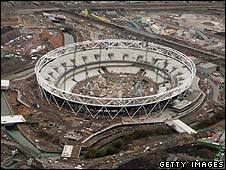 Londoners may be left fighting with European visitors and Olympics sponsors and officials to get tickets for 2012. London Assembly Member Dee Doocey, who is reviewing ticketing plans, said her "bug bear" was the whole Olympic Family would be "ahead of me in the queue". There would also be no preference shown to the capital's residents as European law forbids discrimination in favour of the host country. Which? magazine has warned that demand for seats will fuel ticket fraudsters. Speaking to BBC Inside Out programme Ms Doocey said: "I suppose my big bug bear is the hangers on - all of the Olympic Family that will be ahead of me in the queue." The Olympic Family includes sponsors, officials, their guests, the media and athletes, who will get tickets for the events, specially at the opening and closing ceremonies in the 80,000-seat stadium. During the 1996 Olympics in Atlanta it was reported that four million of the 10 million seats went to members of the "Olympic Family" while in Sydney a ticketing scandal was uncovered. Jacqueline Magnay, the Olympic correspondent at Daily Telegraph, who covered the Sydney Games, said: "I would like to think that all British people do have a quota and have the right to some kind of priority when it comes to the tickets. "But I think the Europeans will have the same access at the same time and I think the British public will be fighting for those same tickets with 200 million Europeans." Ms Doocey said: "It's called European law and there's nothing you can do about it, you're not allowed to discriminate in favour of the host country." Although the London Organising Committee of the Olympic Games (LOCOG) are yet to reveal ticket prices, going by the previous Games people could be expected to pay up to £1,000 for an opening ceremony ticket. Ms Magnay said: "In Sydney the opening ceremony tickets were $1500 dollars, so that's about £700, so I would think that an opening ceremony ticket would be at least £1000." Taking advantage of the demand would be fraudsters, warned Which? magazine, who have already spotted websites offering tickets for the Games. A spokesman said: "They are going to create something that looks like the real deal in the hope that in the enthusiasm, you get carried away and you hand your details." 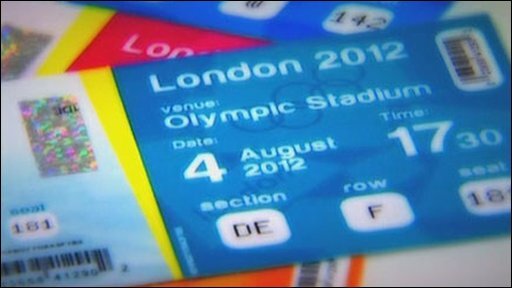 The real tickets will be available on LOCOG's web site and will become available next year. Are you planning on buying tickets for the 2012 Olympics? Get in touch and let us know what you think about this story. I think that the article is well written and holds a lot of truth. I think it is unfortunate that not only Londoners but also the rest of the UK will have to scrap to get tickets for 2012. The Olympics is meant to unite a country and pull everyone together in order to make it the huge success it should be. However, I feel that if the UK public are unable to access the games then it would have a huge negative impact. People who have paid for us to have the opportunity to hold the Olympics through taxes, surely need to be given the chance to see some of the action. Also we could miss out on inspiring the next generation of British Olympians if younger people can't access tickets. It's an event that the organisers say should bring people from all backgrounds together, but it's in danger of turning out to be a tournament for the Rich who can afford to pay the obscene money to ticket touts. Kelly Southerton was on the Radio the other week talking about how the Olympic Stadium should stay as an athletics track after the event to inspire people to take up athletics. However surely the most powerful inspiration would be for them to have the chance to see the likes of Kelly compete in their own City. This is a great opportunity and needs to be taken with both hands, otherwise we could see a backlash from the UK tax payer. I don't really earn much money but would really love to save up and take my younger brothers to the opening ceremony, who will be 15 and 13 respectively when the games start. Hopefully by then I might be earning more but intend on saving in the hope and if not we can watch something else. There's always been concern about attendance at lower profile events. Tickets for the opening and closing ceremonies and high profile events like the 100m final should be allocated to people who buy tickets for the lower profile events. Also, why don't they schedule the Olympic and Paralympic events to run concurrently? That way both would be equally well attended. Have the organisers never heard of equality? Wouldn't that be a brilliant way for Britain to lead the way!.... but we all know it won't happen. I am from New York and was hoping to buy tickets for the Opening Ceremony only. Now that I see the prices are going to be sky high (I could go on another vacation instead), I will be over friends or family's, watching on the telly. Also, I think it's a sin that Londoners would somewhat be out priced to see the games, considering, the taxes they are paying towards them. It is such a disgrace, that tickets can not be given to the peoples' of Britain. So this means we have to fight for tickets from the tourist industry as well. This is going to have a negative impact on London 2012, because no one can afford or get tickets, so who is going to cheer for our side? So the population of people in London are only worth 20%. But the sponsor and media are worth more to the London 2012 team. On their website they say ' It was the result of three years' hard work by a dedicated bid team supported by millions of people around the UK.' So where are the tickets for the millions of people around the UK? Dee Doocey is sadly mistaken on the European law. She is right that the ticket allocation cannot be discriminatory but that does not mean that Londoners may not have precedence. If tickets were offered on an initial basis to all those households who had paid the 'Olympic Tax' in London, then the allocation would not breach European law because it would not be based on nationality. I'm not sure that European law would prevent Londoners (i.e. residents of London) getting preferential treatment when it comes to getting tickets for the Olympics. I could understand it if we tried to restrict access to "only the British" but preferential treatment for local residents surely isn't catered for in European law (otherwise it would be illegal to give Congestion Zone discounts to those living within the Zone, surely?)? The idea that European Law would stop 2012 tickets being set aside for Londoners or UK residents makes no sense to me. I have put in for the ballot for Champions League final tickets for the last three years and every time that has been an allocation for those with an address in the host country and another allocation for those from elsewhere in Europe. The same was true of tickets for the 2006 World Cup in Germany. If UEFA and FIFA can do it then why can't 2012. Living in Tower Hamlets, I have endured years of noise, congestion, pollution and inconvenience due to the Olympic site being built just down the road from me. On top of this, like all other London council tax payers, I have also had to pay for this "privilege". Come 2012, once the games start, our lives will become hell as the world descends on an already overcrowded corner of London. The one silver lining was, I thought, as a host borough, we would at least get entered into a ballot for tickets or maybe even first refusal on buying them. Now it seems we're to be given the same preference as someone who has never even visited London before. As a Londoner I look forward to London 2012 and will be keen to get tickets for anything I can - as there are 9.2 million I remain confident I'll enjoy some small slice of the Olympic and Paralympic action. I do though find it slightly ironic when Londoners argue that they should be first in the line to get hold of tickets because of their contribution. First and foremost our contribution as Londoners is much less than those of Lottery players but I don't hear anyone arguing that the Nation's lottery players should get first refusal on tickets? Secondly it is Londoners who in the long term will benefit most from London 2012 through the regeneration of a long overlooked part of East London. In addition to that the 9000 odd people employed on the site are, I am guessing, most likely to be Londoners so we're already reaping a direct benefit from the investment. Are we an Olympic token?